The NCD Component Library makes it easy to integrate ProXR controllers into Microsoft Visual Studio. 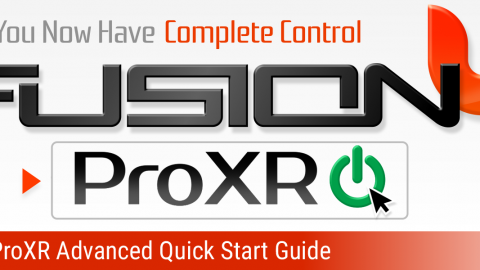 The NCD Component Library is a complete command set that eliminates most of the detailed programming, allowing you to take control of ProXR controllers using high-level functions. With the NCD Component Library, you will receive over 40 samples from A/D Conversion to Duration and Pulse Timing and best of all, it’s FREE!! We want the user to be able to experiment with all the different samples available, so as of right now the samples cannot be downloaded individually. With the NCD Component Library we’ve “started” the programming for you. We say ‘started’ because these are fully functioning samples, but we’ve also included the source code so you can customize them to your exact needs. The NCD Component library is a plugin for the Microsoft Visual Basic that greatly simplifies the communications to the NCD product line. 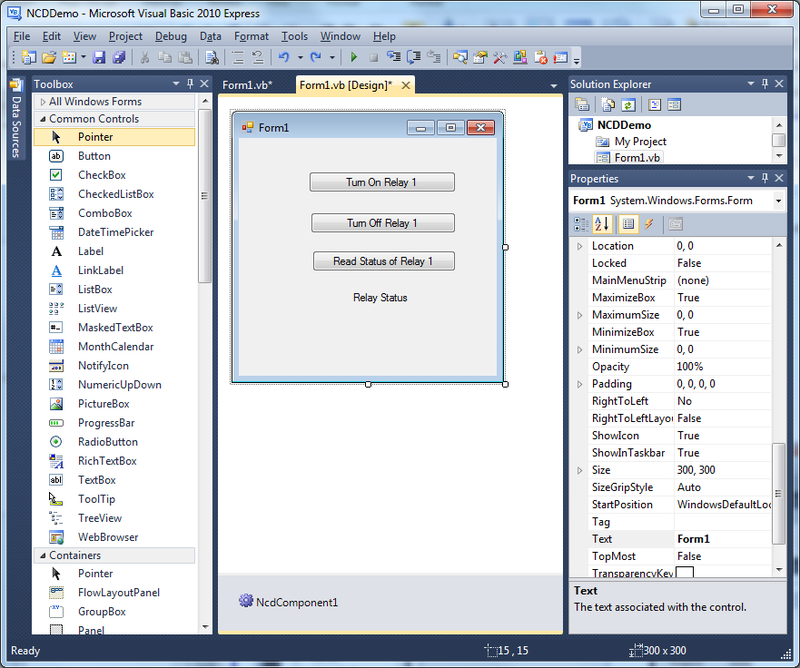 The sample can be run in Visual Basic and fully customizable to your needs. It is compatible with version 2005, 2008, and 2010. 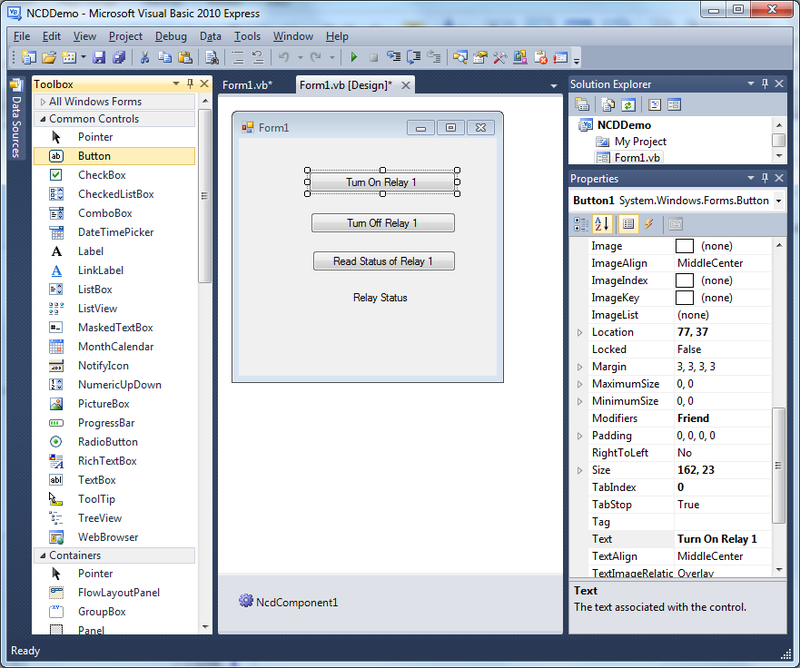 The instructions are shown using Visual Basic Express 2010. The NCD Component Library also supports the C# programming language for those who are more comfortable with this program. Visual Basic is our preferred language for communicating to the NCD product line. Visual Basic is engineered for productively building type-safe and object-oriented applications. The following set of instructions will guide you in learning how to operate your device using the NCD Component Library in Visual Basic. 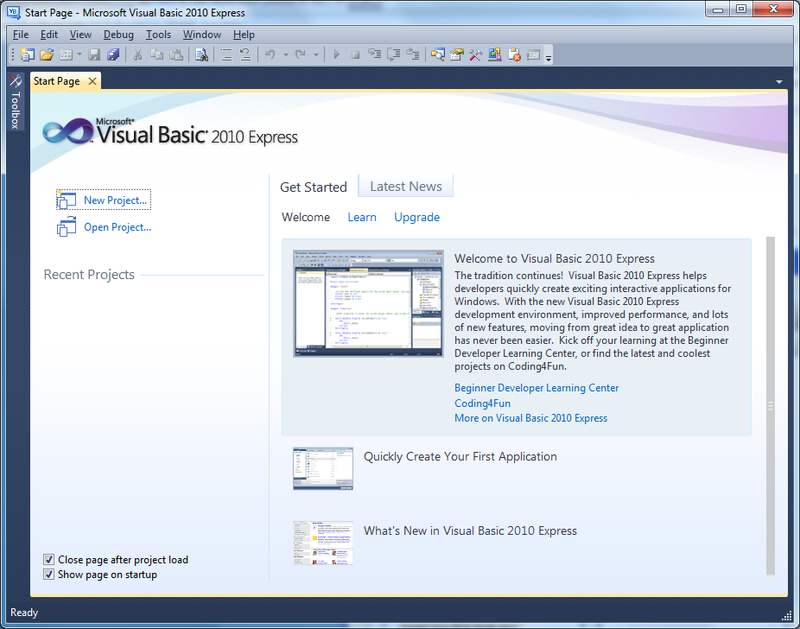 The example provided here is developed for Visual Basic 2010 Express Edition. 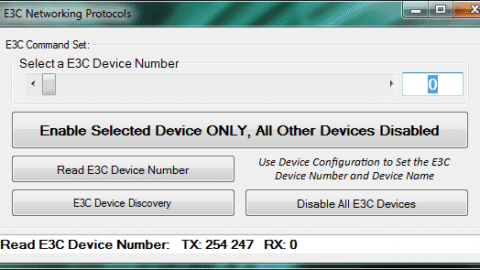 Follow these simple steps and you will be on your way to controlling the NCD device from your desktop computer in 30 minutes or less. 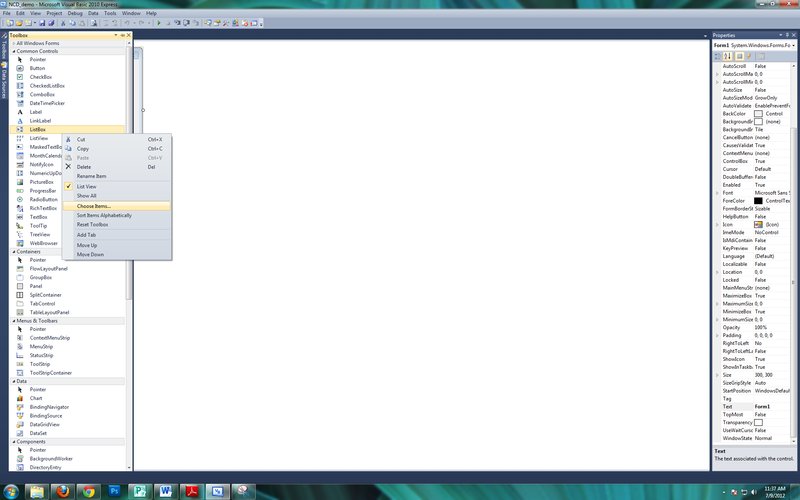 From the Windows Start Menu, open the Visual Basic Express 2010 program. Click the ‘New Project’ link on the left. 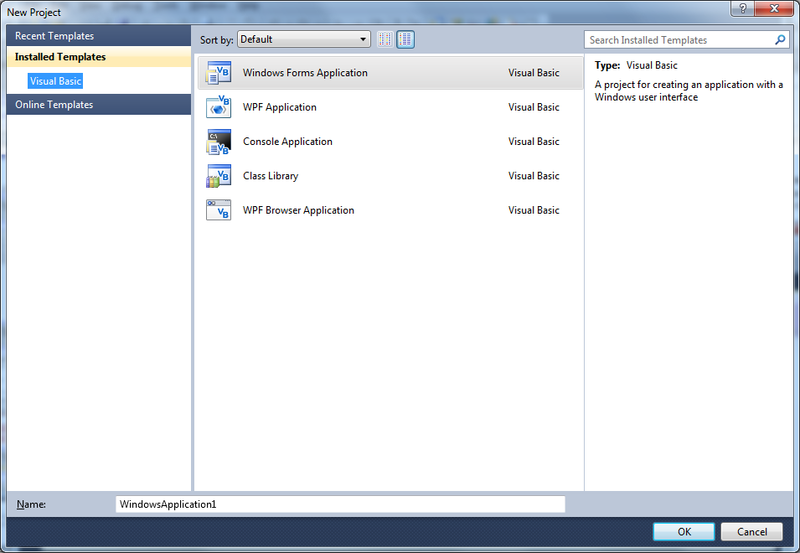 From the ‘New Project’ dialog box, select ‘Windows Forms Application’ and click ‘OK’. 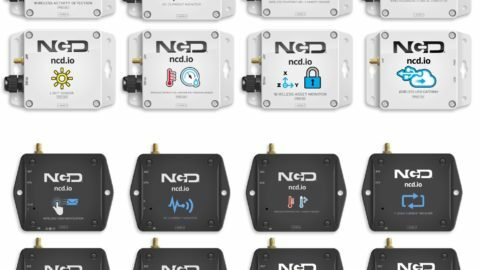 Step 2: Add the NCD Component to your toolbox. The project will open displaying Form1. Expand the Toolbox menu at the left. Right-click in the Toolbox menu and select ‘Choose Items’. Browse to select ‘ncdcomponent.dll’ from your computer. Add NCD Component to the Form by dragging and dropping the component onto the form. Note: It will not display on the form; however, it will display under the form. The next step is to set up the properties of your device. 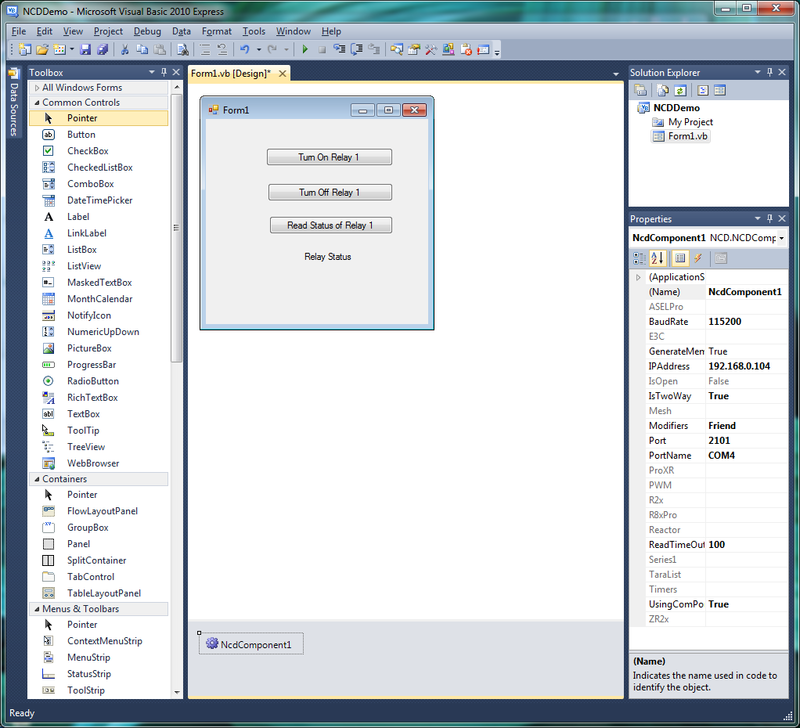 Click on the NcdComponent1 at the bottom of the Visual Basic window as shown below. Make sure that the Properties Window is displayed; it is shown at the right below. The next step is to add three buttons to the Form to allow you to make selections with your device. Click on the ‘Button’ menu control in the Toolbox and drag it to your form. Repeat this step two times. Properties Window is displayed; it is shown at the right below. Use the Text property to change the words displayed on each button. 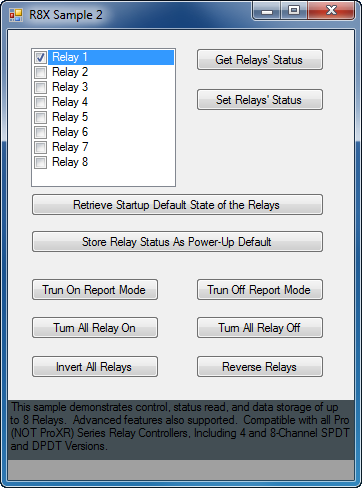 The next step is to add a label to the form that will allow you to display the status of the relay. Click on the ‘Label’ menu control in the Toolbox and drag it to your form. Use the Text property to change the words displayed on the label. 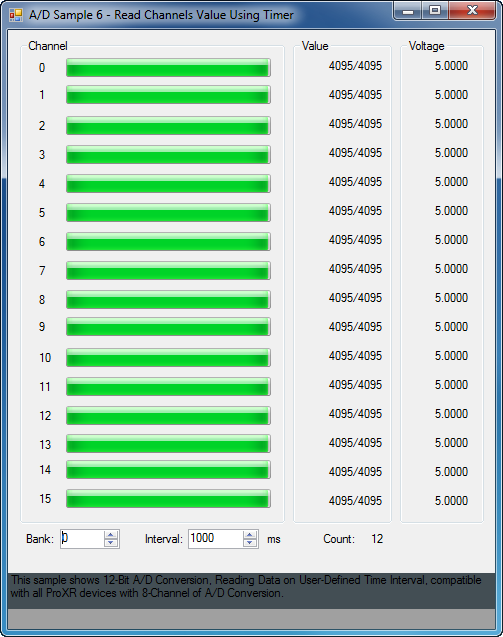 The next step is to add the visual basic code that will open the port when the form is loaded. 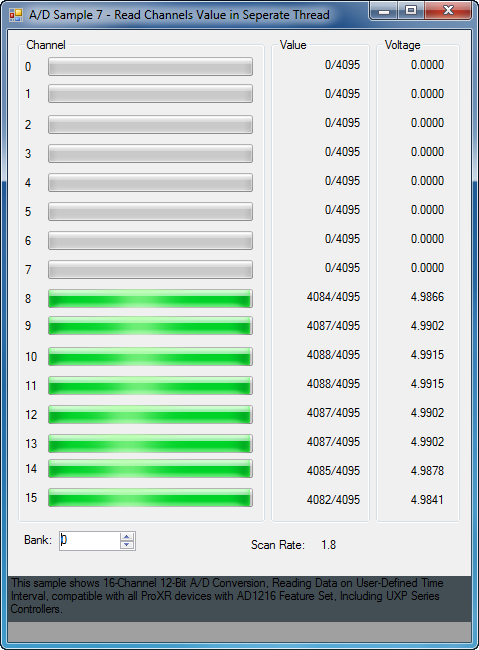 Double-click on the background of the Form1 in the ‘Design’ view as shown below. This will take you to the coding window for the Load event. Note: As you type, you may select the appropriate commands from the shortcut menu that appears. 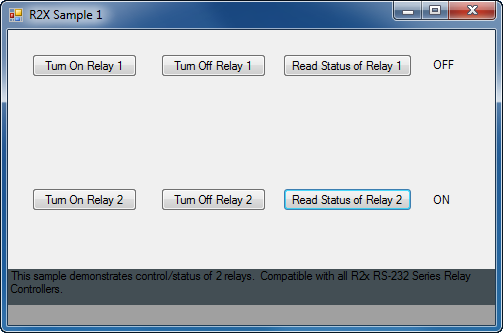 The next step is to add the visual basic code that will turn the relay on or off and read status of the relay in the button’s click event. Return to “Design’ view of the form and double-click on the first button. This will take you to the coding window for the button’s Click event. Note: As you type, you may select the appropriate commands from the shortcut menu that appears. Choose the appropriate NCD device (such as ProXR). Return to “Design’ view of the form and double-click on the second button. This will take you to the coding window for the button’s Click event. Return to “Design’ view of the form and double-click on the third button. This will take you to the coding window for the button’s Click event. Note: This will read the status of the relay and display it on the label on the Form. This sample shows simple 8-Bit A/D Conversion, compatible with all ProXR devices with 8-Channels of A/D Conversion. 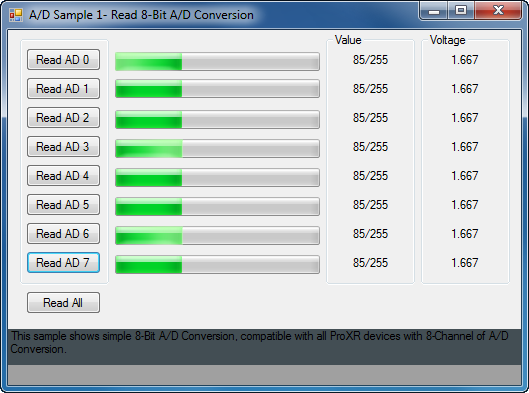 This sample shows simple 10-Bit A/D Conversion, compatible with all ProXR devices with 8-Channels of A/D Conversion. This sample shows 16-Channel 8-Bit A/D Conversion, compatible with all ProXR devices with AD1216 Feature Set, including UXP Series Controllers. This sample shows 16-Channel 12-Bit A/D Conversion, compatible with all ProXR devices with AD1216 Feature Set, including UXP Series Controllers. 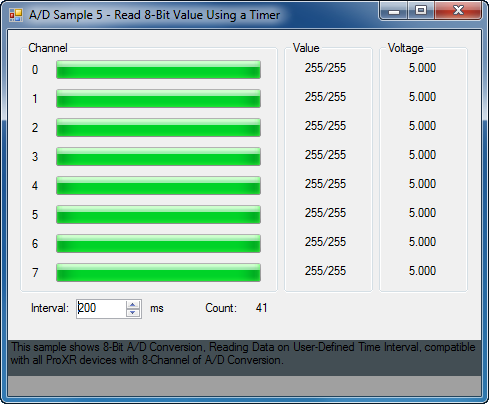 This sample shows 8-Bit A/D Conversion, Reading data on User-defined Time Interval, compatible with all ProXR devices with 8-Channels of A/D Conversion. 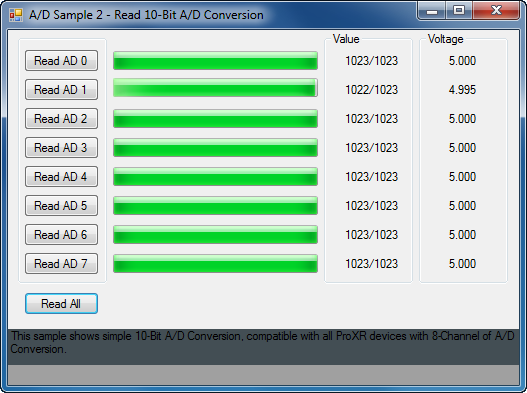 This sample shows 12-Bit A/D Conversion, reading data on User-defined Time Interval, compatible with all ProXR devices with 8-Channels of A/D Conversion. 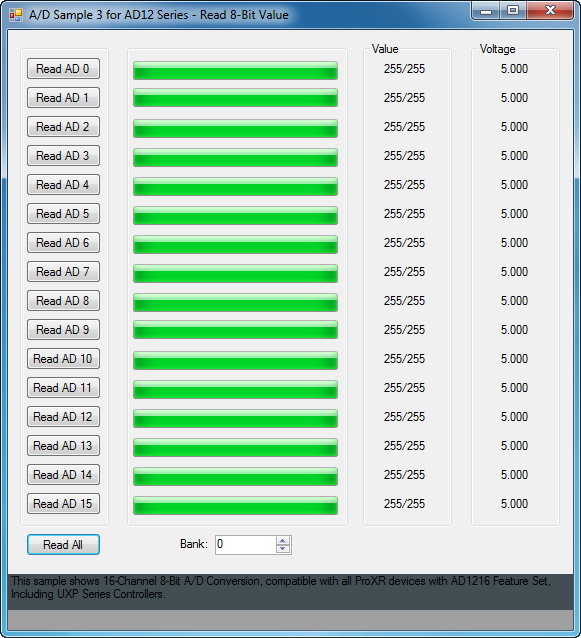 This sample shows 16-Channel 12-Bit A/D Conversion, reading data on User-defined Time Interval, compatible with all ProXR devices with AD1216 Feature Set, including UXP Series Controllers. 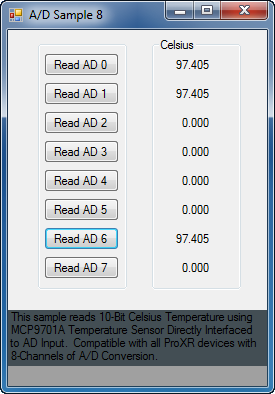 This sample reads 10-Bit Celsius Temperature using MC9701A Temperature Sensor directly interfaced to AD Input. Compatible with all ProXR devices with 8-Channels of A/D Conversion. 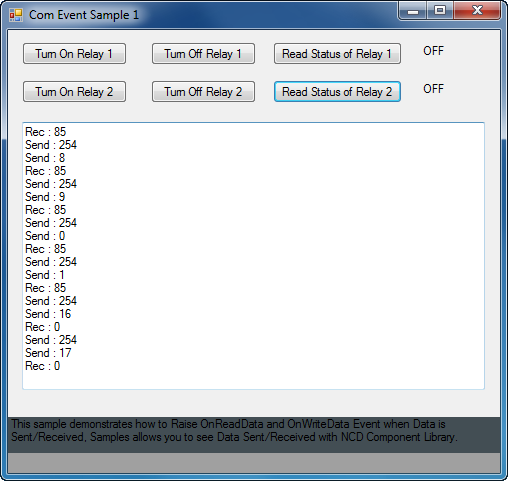 This sample demonstrates how to Raise OnReadData and OnWriteData Event when data is Sent/Received, sample allows you to see data Sent/Received with NCD Component Library. 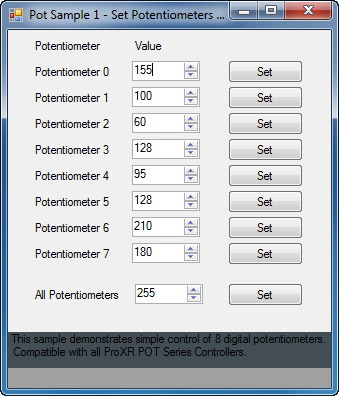 This sample demonstrates simple control of 8 digital potentiometers. Compatible with all ProXR POT Series Controllers. 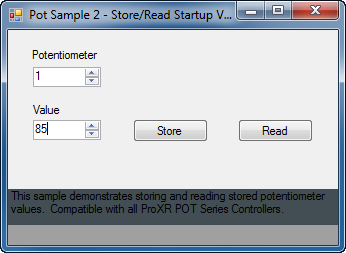 This sample demonstrates storing and reading stored potentiometer values. Compatible with all ProXR POT Series Controllers. 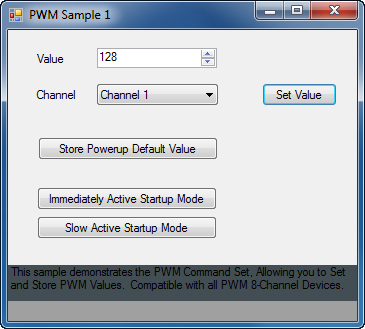 This sample demonstrates the PWM Command Set, allowing you to Set and Store PWM values. Compatible with all PWM 8-Channel Devices. 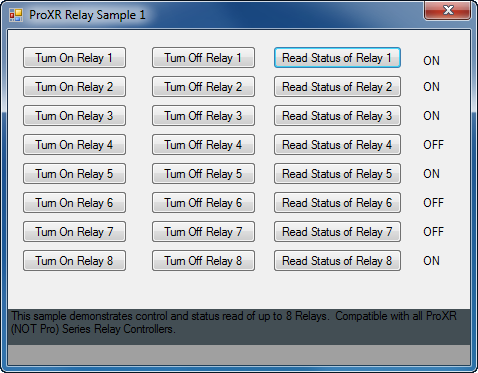 This sample demonstrates control/status of 2 relays. Compatible with all R2x RS-232 Series Relay Controllers. This sample demonstrates control/status of 2 relays and demonstrates data storage features. Compatible with all R2x RS-232 Series Relay Controllers. This sample demonstrates control, status read, and data storage of up to 8 relays. Advanced features also supported. 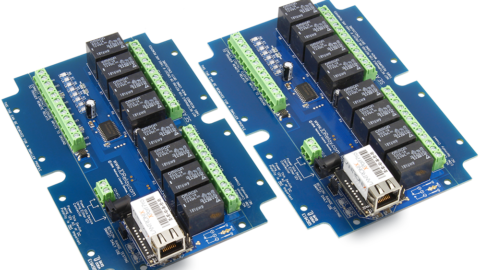 Compatible with all Pro (Not ProXR) Series Relay Controllers, including 4 and 8-Channel SPDT and DPDT Versions. 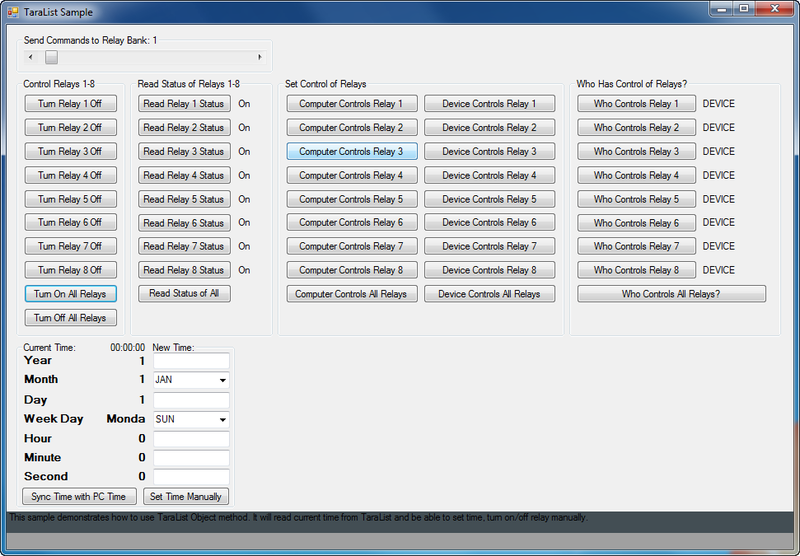 This sample demonstrates control and status read of up to 8 relays. 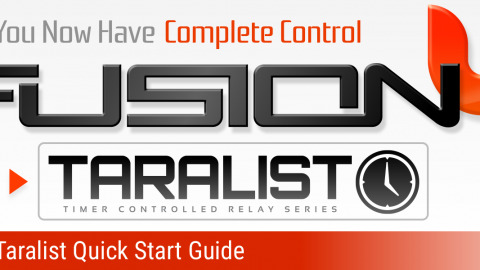 Compatible with all ProXR (Not Pro) Series Relay Controllers. 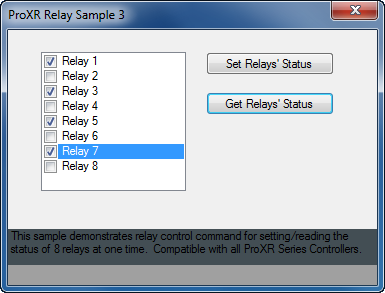 This sample demonstrates bank selection features of ProXR Series Relay Controllers. 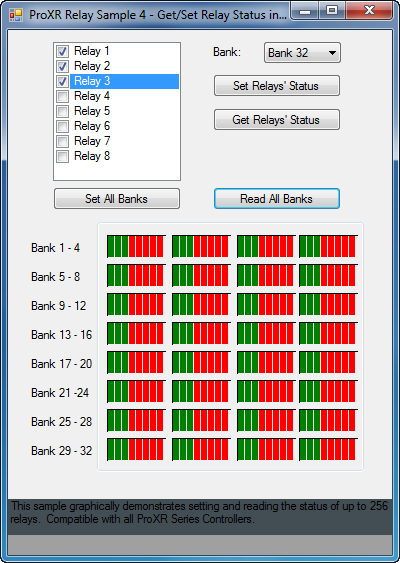 This sample demonstrates relay control command for setting/reading the status of 8 relays at one time. Compatible with all ProXR Series Controllers. This sample graphically demonstrates setting and reading the status of up to 256 Relays. Compatible with all ProXR Series Controllers. 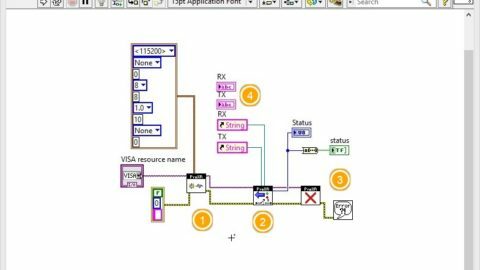 This sample demonstrates how to activate a relay at a user specified time for a user specified duration. Compatible with all ProXR Series Controllers. 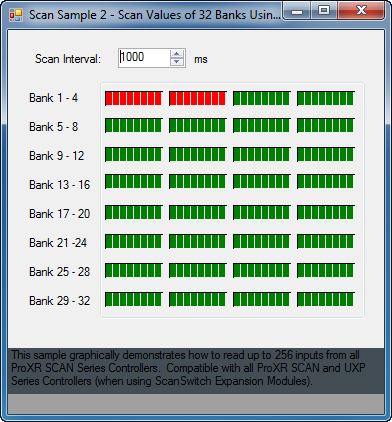 This sample demonstrates how to read inputs from all ProXR SCAN Series Controllers. Compatible with all ProXR SCAN and UXP Series Controllers (when using ScanSwitch Expansion Modules). 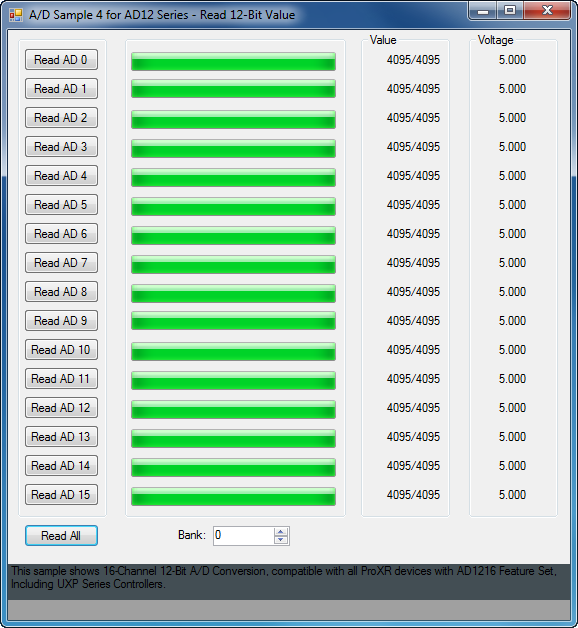 Read up to 256 Inputs from All ProXR SCAN Series. 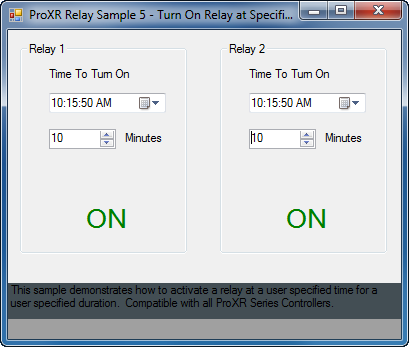 This sample demonstrates ProXR Relay Duration and Pulse Timing Features. Compatible with all ProXR Series Controllers. 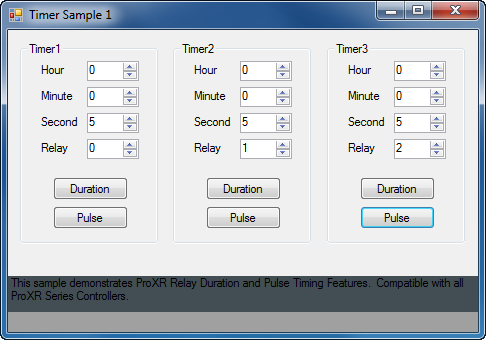 This sample demonstrates ProXR Relay Duration and Pulse Timing Features, allowing you to activate timers simultaneously. Compatible with all ProXR Series Controllers. 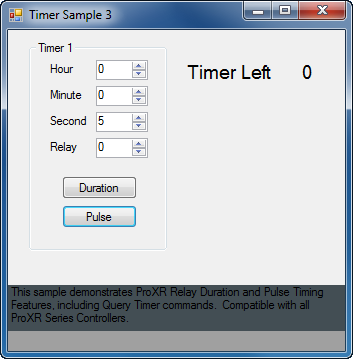 This sample demonstrates ProXR Relay Duration and Pulse Timing Features, including Query Timer Command. Compatible with all ProXR Series Controllers. 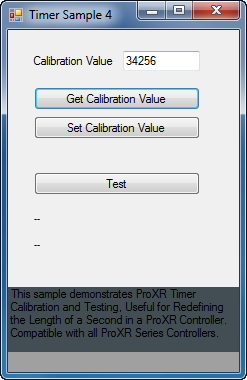 This sample demonstrates ProXR Timer Calibration and Testing, Useful for Redefining the Length of a Second in a ProXR Controller. Compatible with all ProXR Series Controllers. 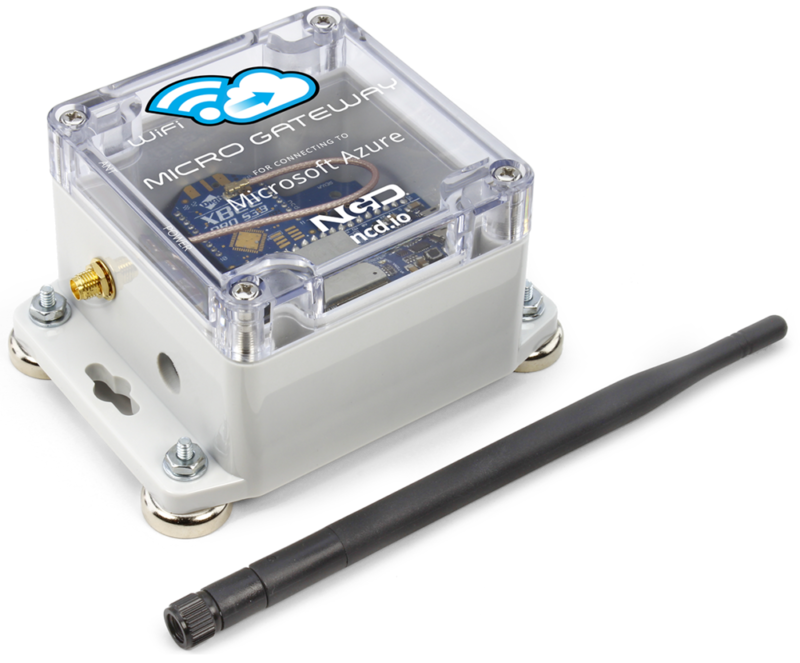 This sample shows how to set and retrieve information from a ZigBee module. 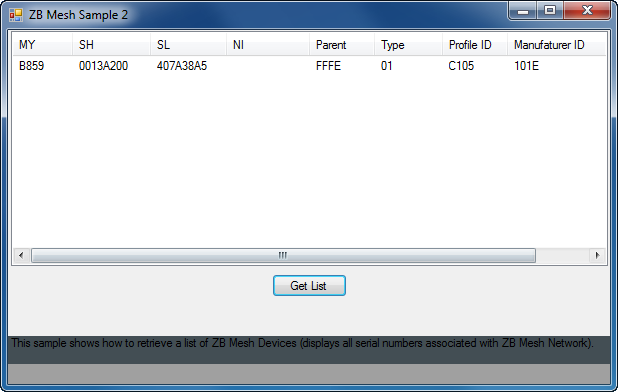 This sample shows how to retrieve a list of ZigBee Devices (displays all serial numbers associated with ZigBee Mesh Network). 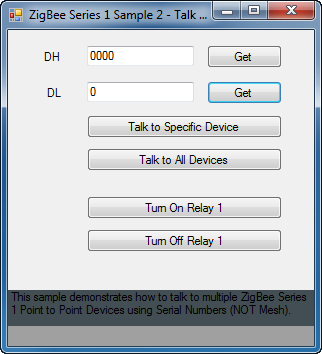 This sample demonstrates how to talk to multiple ZigBee Devices using Serial Numbers. This sample shows how to send and retrieve information from a 802.15.4 Wireless Series 1 Point to Point module (NOT Mesh). 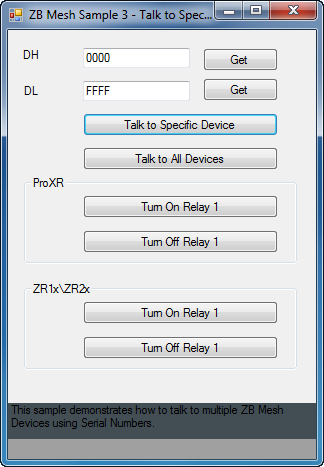 This sample demonstrates how to talk to multiple 802.15.4 Wireless Point to Point Devices using Serial Numbers (NOT Mesh). 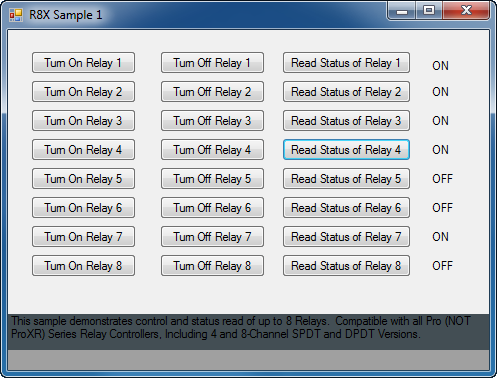 This sample shows how to Set and Receive Relay Status and Read AD Input values for all Reactor Series Controllers. 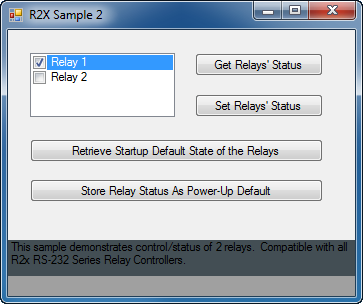 This sample shows how to Set and Receive Relay Status and Read AD Input Values for all Tara list Series Controllers.